Social networks have been pretty popular lately, with the release of Catfish last week, a documentary which followed a twisted story created right from the pages of Facebook. Now, this week we get a look into the beginnings of the social network giant, and the people who founded it. If you are on the internet, there is a very solid chance that you own a Facebook page. You might have had it since college, when the site only issued pages to people with .edu email addresses. Although, you might be one of the millions of members who joined after the site went public to all users a few years back. There is no debate as to how much the this social media giant affects the world around us. Everywhere on the internet we see boxes to click to show that we “Like” something, which then shows up on our news feed. (Look no further than to the right side of our page for an example.) New acquaintances are no longer given just phone numbers, but names and the phrase “Facebook me”. It’s hard to believe that this all started in Harvard dorm in 2004. One of my original misgivings about seeing this film take place, was setting Facebook founder Mark Zuckerberg as the protagonist of the film. 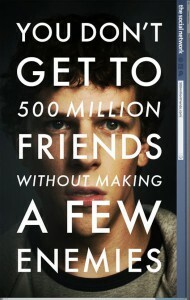 You see, as you’ll find out in the film, Zuckerberg is a bit of a jerk. Sure, he’s highly intelligent, and these days he’s also massively wealthy. Although, knowing the story behind Facebook, and how Zuckerberg screwed a few people on his way to the top, it didn’t really seem like a guy I’d like to follow on film. I couldn’t be more wrong. Writer Aaron Sorkin and director David Fincher never gloss over the character flaws of Zuckerberg, in fact they make them blatantly obvious, and almost at the same time, endearing. They include every dirty detail, including the accusations of intellectual property theft, the betrayal of partner Eduardo Saverin, and every single one of Zuckerberg’s character flaws. They highlight this all in a slightly non-linear storyline in which the story switches to the origin of Facebook, to the court cases of Zuckerberg vs. Saverin, and Zuckerberg vs. the HarvardConnection men. So often in film computer science is taken to a comical level, where anyone with a little bit of skill behind the keyboard laughs at how ludicrous the scene before them is. It isn’t hard to understand why Hollywood does this, because lets face it real computer hacking and programming would be boring to watch, that is until now. David Fincher somehow manages to make even basic coding into a valuable story idea. One of the best moments in the opening of the film is watching Zuckerberg go back and forth between his blog, and the programming of his first Harvard success, FaceMash.com. What keeps the film running though is the performance of Jesse Eisenberg. Last year when Zombieland became a surprise hit, I heard a lot of talk about how Eisenberg was a “Michael Cera clone”. I’d like to see them say the same thing about this performance. Eisenberg is brilliant as the self-centered genius, with little regard other than his meteoric rise. His on screen chemistry with co-star Andrew Garfield as Eduardo Saverin is fantastic. Add in another great turn by Justin Timberlake as Sean Parker, and you have a cast that has to be waiting for awards season nominations to roll in. Fincher once again proves that he is among the best modern directors out there. The pacing, the lighting, the acting, the script, everything about The Social Network is perfect. Fincher (with help from writer Aaron Sorkin) takes what could have been deleriously boring material and makes it one of the most thrilling films of the year. Do not miss this film!